Known for their chilled-out atmosphere, delicious shisha and generously sized bites, we headed over to see if Wel3a’s new branch would maintain such an esteemed reputation. 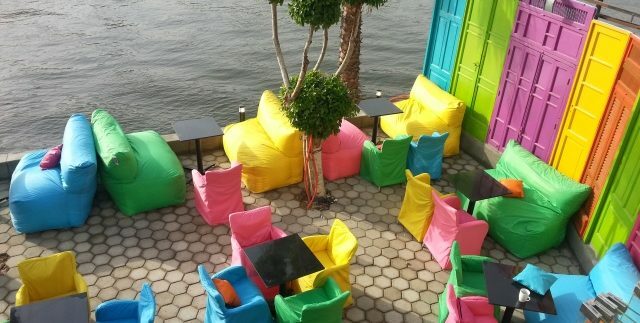 We instantly fell in love with their new waterside location, right on the edge of the Nile in Zamalek’s Club 33. The indoor area is an open space, only enclosed overhead, whilst the outdoor terrace is shielded from three sides – meaning the wind was just enough to blow away any lingering shisha smoke. Wel3a’s famous bright, multicoloured colour scheme is reflected in the low, sink-in beanbag sofas, chair covers and stripy walls, whilst a collection of wall art features sketches of iconic figures including Marilyn Monroe, Dali and Charlie Chaplin, adding a fun, funky element to the décor. Of course, a view of the water, passing feluccas and the glittering lights of the city all add to the experience. The menu is an extensive list of hot drinks (9LE-19LE), teas and herbal infusions (8LE-14LE), iced slushies (13LE-24LE), frappes (22LE), smoothies (18LE-23LE), fresh juices (11LE-12LE), soft drinks (11LE-12LE) and a curious list of special cocktails (18LE-22LE). We chose to divulge in one Wel3a cocktail (19LE), a strawberry and banana smoothie (23LE) and a B-Oreo milkshake (22LE). Described as a ‘must try’, the Wel3a cocktail was absolutely delicious; a thick, fresh and flavourful blend of peach, sharp kiwi and sweet pineapple. Apparently ‘back by popular demand’, the strawberry and banana smoothie was another masterpiece, evidently made with sweet, ripe bananas. The B-Oreo milkshake was the least delectable, and tasted a little too much like powdered chocolate, but was certainly tasty, milky and fluffy enough to satisfy any sweet tooth. As for their food menu, this Wel3a has teamed up with neighbouring diner, Grizzly, to provide hearty meals. The food was delivered swiftly in takeaway boxes and was predictably satisfying, however, despite putting a selection of delicious sounding desserts on their own menu, disappointingly, none are available from Wel3a itself. Their legendary shisha menu didn’t disappoint either; locally produced Nakhla flavours, as well as imported Al Fakher and Starbuzz tobacco were available. We ordered one local cherry shisha (12LE) and a grape shisha (18LE), imported all the way from the UAE. Both were quickly and professionally prepared, and were in no need of fixing up. Both flavours were strong, smooth and all-around excellent, although we’re not sure paying extra for imported flavours is totally necessary, or makes much of a difference in the quality. With this new venue, the owners of Wel3a have excelled themselves by finding such a brilliant location, creating a chilled, tranquil setting with a fun and contemporary decor. The shisha is definitely still up to standard, but we wait with baited breath for their desserts. Wel3a provide their very own felucca services from the jetty at the end of the terrace. The delicious juices and fruity shisha, not to mention the awesome location. Wel3a's renowned desserts were not yet available.